We recently attended Sadabishegam of our relative and I was able to take few clicks that would help to explain about the gracious occasion better. This is usually celebrated when the husband completes 80 years of age. Primarily the son of the couple take responsibility of conducting the function for their parents. However, nowadays both sons and daughters jointly take ownership in conducting this memorable function. At this age the couple would have daughters in law/sons in law and grand children who fill the function with endless joy. The function celebrated upon completion of 60/70 years of age is called Sashtiapthapoorthy/Bhimarathashanthi respectively. It will be the star birthday of the husband when the function is conducted. These functions are more importantly conducted at Thirukadaiyur whilst it is also good doing at their own city of residence. The most significant part of the function is the "Abhishegam" for the couple with sacred water. During Sashtiapthapoorthy & Sadabishegam Mangalya dharanam is performed. The dress worn by the couple during Abhishegam is given for charity. Rudra Ekadesi is performed the day before the function. Abhishegam is performed on this day too. But the Abhishegam is performed only by the Priests and not by invitees. Ayush homam is also conducted that enhances their life with good health. Brother of the woman take the privilege of bringing in new dresses for the couple that is worn after Abhishegam. Wearing that saree Mangalya Dharanam is being performed. Thirumangalyam is also usually gifted by the Brother. Brother's take this privilege in the place of their parents to offer Seethanam. The tradition shows how bonded we are even at the age of 80 in terms of iterating our traditions. In some families, these occasions act as a ice breaker when there is a long standing silence between relatives. In all means functions bring in lot of instances to cherish. 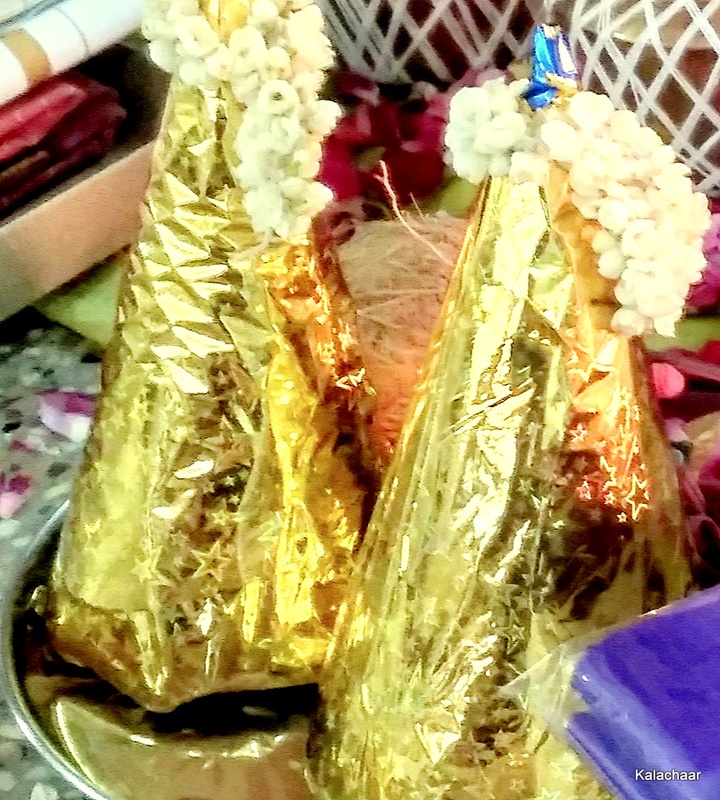 Paruppu thengai (Paniyaram) is a must to be brought either by brothers/parents or by sons who conduct the function. People who visit the function to get blessings from the elderly couple also bring in Sarees & Blouse/Dhoti & towel for the couple as it is considered as a sacred way of getting their blessings. Rudram is chanted on this day by the priests and archanai is being made to the wholly water kept in the Bronze vessels (Kalasam). The family members usually perform archanai while Saasthrigal recite the mantras. The sons and daughter in laws must wear madisaar during the occasion till the Abhishegam is completed. Usually, priests provide list of kalasam required and other Pooja materials for the function. Few important things that are required for the abhishegam are taken care by the priests themselves. We need to be prepared with the exchange cloths and Towels that are required immediately after Abhishegam. The couple are elders and cannot withstand the cold for long time. The visitors are also allowed to pour the holy water after the priest complete the initial part of it. 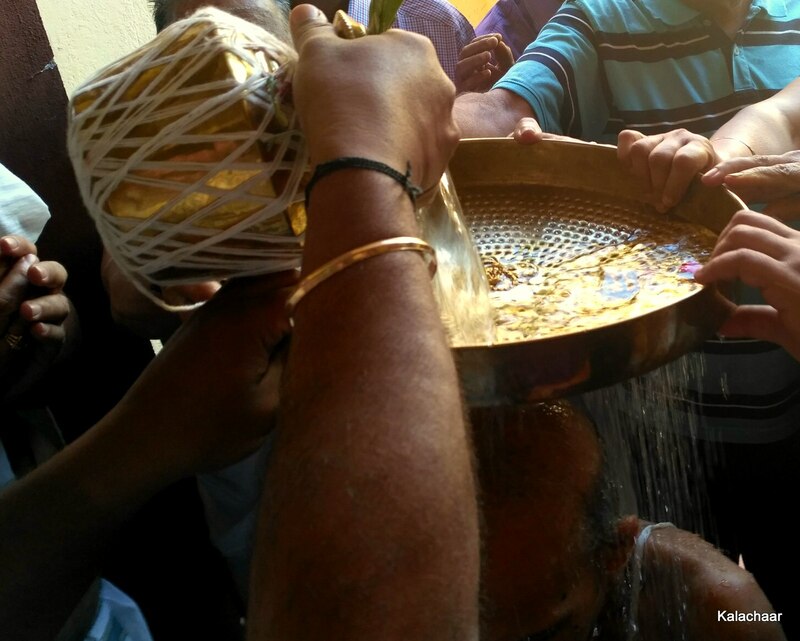 Golden jewels are also placed on the wide Bronze Sieve (Jaladai) used to perform Abhishegam. Hence be prepared for the occasion which is most important and do not drag more time since this might end up leaving the couple in wet dress for long time. On this day the couple is considered as Parvathi and Paramasivam and hence blessings from them is most auspicious. Thampathi Poojai is also conducted on this day. You may ask your family Priests (Saasthrigal) for further details. Maakolam and Plantain trees are used to decorate the entrance with of the house and the place where the function is being conducted. We need to be prepared with Kuthu vilakku, required oil, match boxes, flowers for the invitees, thamboolam to be distributed at the end of the function. Garlands, new dresses for the couple and their family members are bought to add more charm to the function. We may wish to arrange for return gifts for the invitees. Nowadays, the functions are conducted in Mini Halls. Hence this has to be arranged in advance. And finally, a complete meal that is considered a best method of honoring the visitors is also prepared and served. 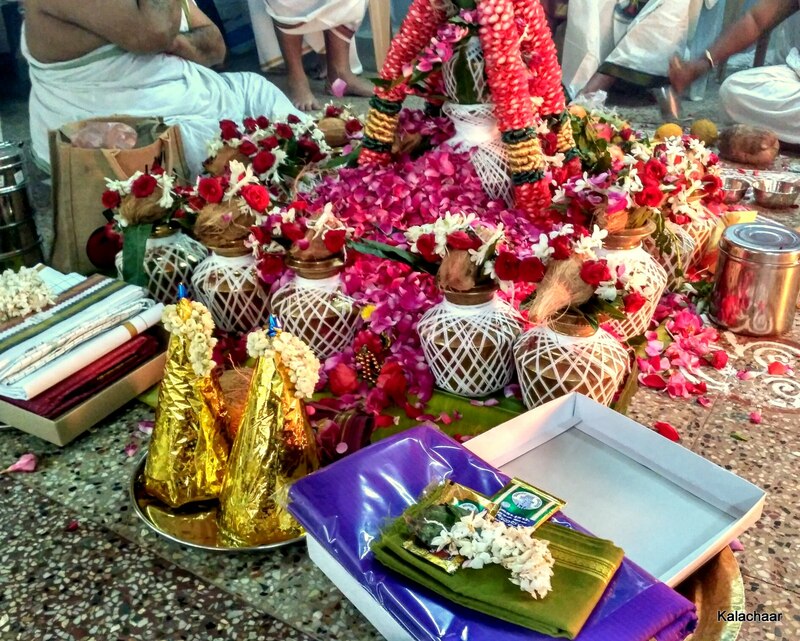 Sumangali Prarthanai and Samaarathanai are also conducted before the function. Family deity is also visited before/after the function. Latha! Very interesting to read this article! This has brought the reminiscence of the Sathabhishekam held in our family during December!Thank you for this article ! We have almost done everyritual as narrated here! Excellent article Mythili. It brings me such joyful memories of my parents' Sadabishekam. Your blog is an excellent reference material for many of our traditional celebrations. Thank you for this initiative Mythili. Yes Meena. I did remember the celebration. Thank you. Yes mythili, that's a wonderful write up. Visualised each and every word and gives true joy of attending the function. Keep writing.